Do you know how to penny board? 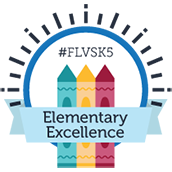 After a summer of practice, our winner of the FLVS Brain Challenge does! 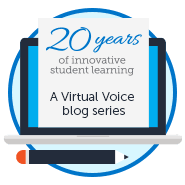 Florida Virtual School student Vinay K. spent the last several weeks making progress on his penny boarding skills and compiled all of the clips of his successes and failures in one final video. As our contest winner, Vinay was the lucky recipient of four admission tickets to Kennedy Space Center in Cape Canaveral, FL. Check out Vinay’s winning video entry in our summer contest below! 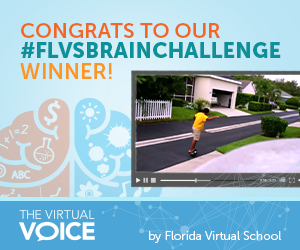 Congratulations to our Summer 2015 FLVS Brain Challenge Winner! Of course, the fact that our summer challenge has ended doesn’t mean the fun has to stop there! Remember the backwards bicycle? If you want to learn something new, just practice! Much like there was when you learned to swim or ride a bike as a kid, there’s always a point where your brain kicks in and a skill you were struggling to learn becomes second nature. We’ve all experienced it – and there is something truly special about that “aha” moment when your brain goes from following simple instructions and learning basic facts to a place of mastery where everything clicks. It’s like the amazing “muscle memory” that allows our fingers to fly between buttons on a video game controller or helps this 15-year-old solve a Rubik’s cube in 5.25 seconds with hardly a moment’s thought. There are all kinds of new skills and pathways just waiting to be forged in your brain’s neural network! Tell us how you’re training your brain to master new skills this school year in the comments below. This entry was posted in Homeschool Edition, Student Edition and tagged #FLVSBrainChallenge, Backwards Bicycle, Bike Riding, Contest, Extracurriculars, Growth Mindset, Kennedy Space Center, Muscle Memory, NASA, Piano, Riding a Bike, Rubik's cube, Social Media, STEM, Summer, Video Contest on August 7, 2015 by Marissa Draeger.